Vancouver B.C. 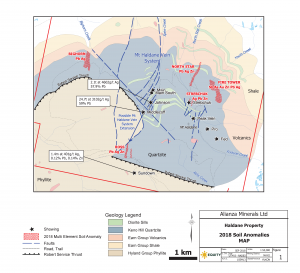 – September 24, 2018 – Alianza Minerals Ltd. (TSXV:ANZ) (“Alianza” or the “Company”) is pleased to report results of the 2018 field program at the high-grade Haldane Silver Property, YT. Results include the identification of two new large silver (Ag)-lead (Pb)-zinc (Zn) soil anomalies and doubling the strike-length of the Ross Anomaly. This program successfully highlighted the potential of the Haldane Property to host new high-grade silver targets. A total of 1,195 soil samples and 55 rock samples were collected predominantly in areas that had no previous or recent sampling, testing possible mineralized faults and lineaments outside of the relatively well-known Mt Haldane Vein System. The Bighorn Anomaly is a new target based on anomalous soil geochemistry located approximately 2.8 kilometers (km) west of the Mt Haldane Vein System. The anomaly stretches approximately 750 metres (m) north-south by 150-250 m east-west in a previously unknown area for mineralization. The anomaly contains up to 1,240 ppm Pb in soil, the highest result outside of the Mt Haldane Vein System, supported by greater than 98th percentile Ag results. No significant mapping or prospecting has been done in the area to date. The orientation of the anomaly is consistent with the northerly trend of most of the mineralized structures on the Haldane property. The anomaly straddles the main access road on the property in an area of poor bedrock exposure. The Ross Pb-Zn-Ag soil anomaly was extended to 600 m in length, doubling the known strike length with anomalous results open to north. Soil results also suggest a second, parallel, mineralized zone 100 to 150 m east. A lack of outcrop in this area hindered evaluation of the Ross Anomaly on surface. A single, 65 m long, east-west oriented trench excavated near the south end of the anomaly failed to reach bedrock (>4 m depth). Nonetheless, soil samples at 5 m intervals along the trench returned highly anomalous results, possibly reflecting proximity to buried mineralization, including >1,000 ppm Zn, for the eastern 25 metres. Results for lead range up to 1,455 ppm in this section, potentially indicating a bedrock source of mineralization at depth. The Ross Anomaly is situated 1.8 kilometres south on strike from the Mt Haldane Vein System and the presence of multiple mineralized structures suggests it could be the extension of the vein system. This would give the Mt Haldane Vein System a strike length of at least 3.5 kilometres. On the north side of the property, soil sampling delineated a narrow, 1000 m long Pb-Ag-Sn-Zn anomaly where sampling in mid-1960’s had detected scattered anomalous Pb-Zn results. The anomaly is continuous from the north side of the grid before disappearing to the south where it meets glacial and fluvial material near North Star Creek. The extent of the anomaly is dominated by large quartzite boulder float with minimal outcrop and mapping detected minor alteration and mineralization along the anomaly. However, mineralization would likely be recessive and buried by the boulders. Significantly, the anomaly trends towards the Strebchuk Pb-Ag Showing, 700 metres further south, where galena-siderite mineralization occurs in a fracture zone in quartzite. Another new anomaly, the Firetower Anomaly, consists primarily of arsenic-antimony-zinc-gold with local tin and is not characterized by strong silver geochemistry. It may be indicative of intrusion-related gold mineralization that is known to occur on the property. The 8,579 hectare Haldane Property is located 25 km west of Keno City, YT in the western portion of the Keno Hill Silver District where companies such as Alexco Resource Corp. and Metallic Minerals Corporation are currently exploring. Notably, the access road to Victoria Gold Corp.’s Eagle Gold Mine crosses the northern portion of the property. Mineralization in the district consists of structurally-controlled, silver-bearing veins. Silver production began in the Keno district in 1913, with over 200 million ounces of silver produced through 1989. Production statistics from the Yukon government Minfile (2003) state that 4.87 million tonnes were mined at an average grade of 1,389 g/t silver, 5.62% lead and 3.14% zinc in that time. The north-trending Mt. Haldane Vein System (MHVS) is the main target area on the property, where initial exploration dates back to 1918. Early workers hand sorted ore from underground workings at the Middlecoff Zone in 1918-19, recovering a reported 24.7 tonnes of ore averaging 3,102 g/t silver and 59% lead. Later work at the Johnson Zone recovered 2.1 tonnes of ore averaging 4,602 g/t silver and 57.9% lead in 1927. Little work was done on the property until the 1960s when trenching and further underground development and drilling was conducted. Recent work, including prospecting, mapping, soil geochemistry and limited diamond drilling, has shown that the MHVS veins have excellent potential for strike extension, which has been corroborated by soil geochemical results from the 2018 program. Additional showings up to three kilometres east of the MHVS, and new soil geochemical anomalies 2.8 km west of the MHVS indicate the potential for other mineralized structures on the property. 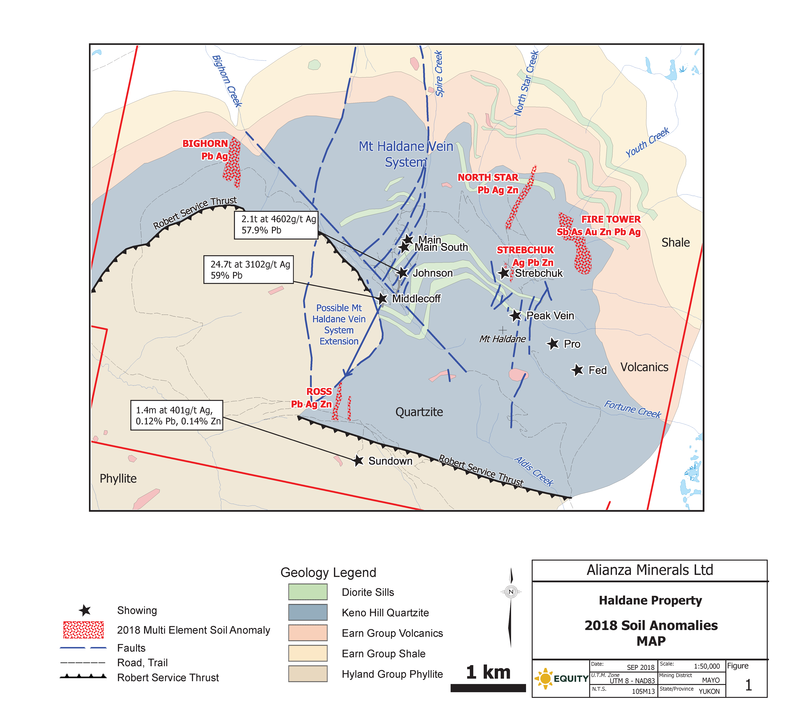 Maps and figures for the Haldane property can be found on the Company’s website www.alianzaminerals.com under the Properties section. The Company has 45.1 million shares issued and outstanding and is listed on the TSX Venture Exchange (TSX-V: ANZ). Mr. Murray Jones, MSc, P.Geo., of Equity Exploration Consultants Ltd. is a Qualified Person as defined by National Instrument 43-101. Mr. Jones supervised the preparation of the technical information contained in this release.